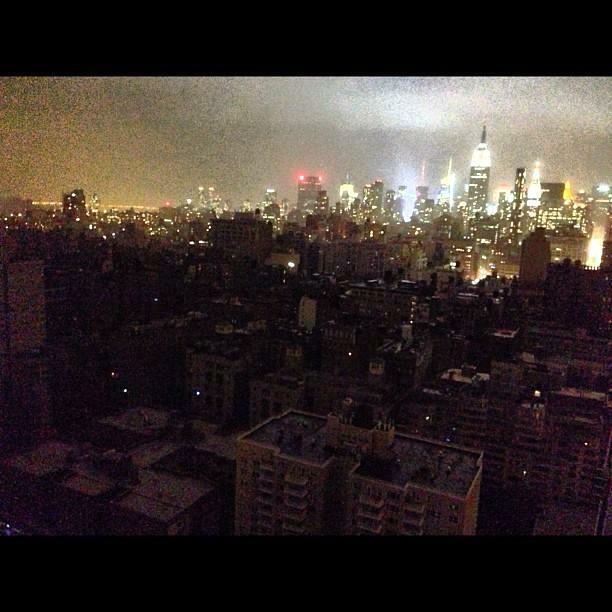 A quick post to let you all know we survived Hurricane Sandy! 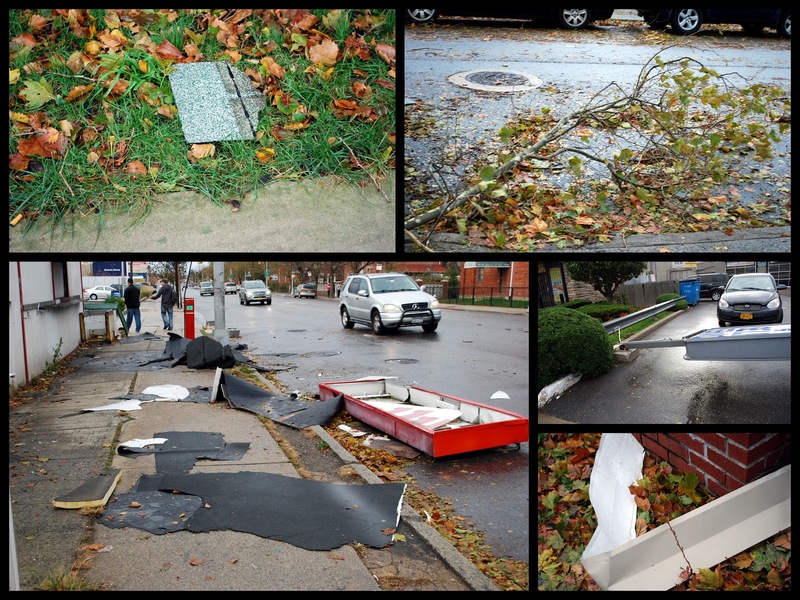 We were very fortunate that our neighborhood in Brooklyn suffered very little damage and that we still have electrical power. My brother and sister-in-law, and my three nephews that live in communities in Nassau and Suffolk Counties in Long Island are among the 90% of Long Islanders left without electrical power. 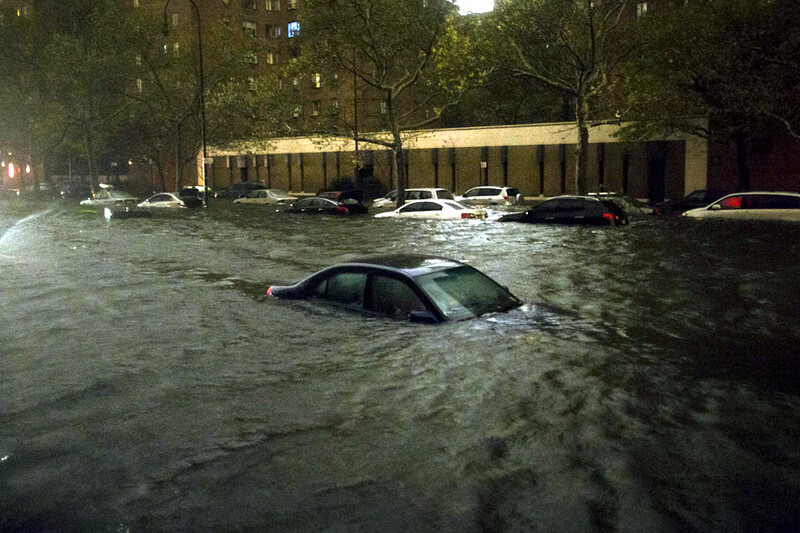 ...as the storm surge poured into all the Boroughs of New York City last night it left a path of destruction. Do you remember my blog post (click here to read) about the charming Jane's Carousel in Brooklyn Bridge Park? 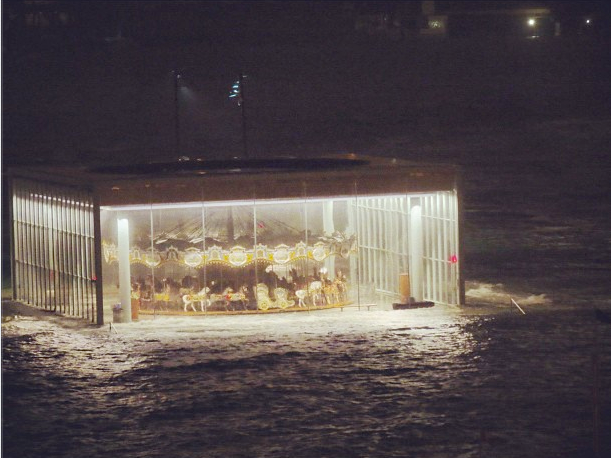 Last evening the East River overflowed its banks and it was almost submerged. 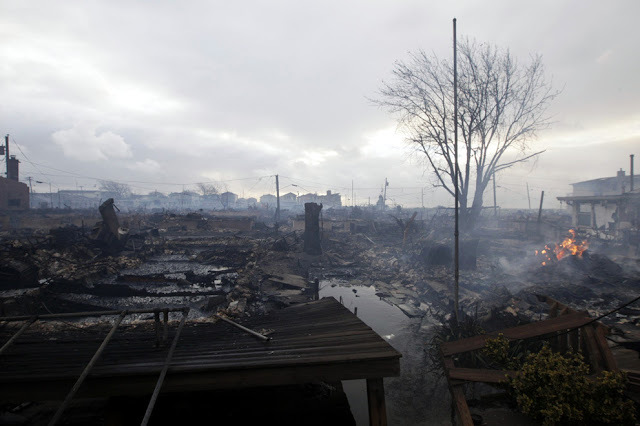 Sadly, the beautiful little neighborhood of Gerritsen Beach, that I blogged about on this post, was almost entirely destroyed by flood waters. The seaside communities of Breezy Point, and Rockaway, Queens (see this post) were severely flooded and suffered many fires. The community of Long Beach, Long Island, and City Island were left almost unlivable without electricity, water, and sewer service. I heard that communities in Staten Island had Katrina like rescues last night, as houses became submerged to the roofs by flood waters. If there was one lesson learned by all with this storm is that orders of an evacuation of low lying coastal areas is important and not something to be ignored in future storms. Except for minor basement flooding, roof and siding damage, broken tree limbs, and spotty power outages, my Brooklyn neighborhood did OK. We were so very fortunate! 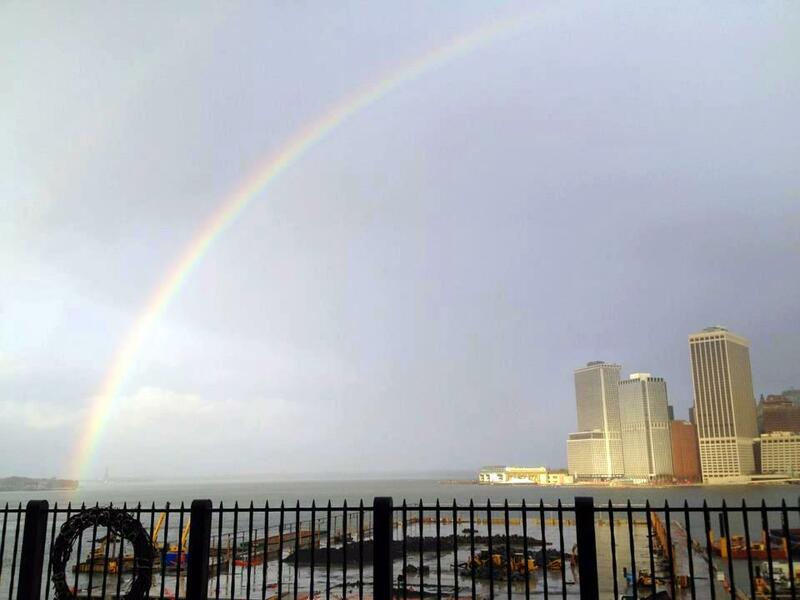 My heart goes out to those whose families suffered the loss of life and property and business damage. You are in my thoughts and prayers. My sincere thanks go out to the first responders who worked tirelessly through the storm, risking their own lives to help others. Thank you to all who e-mailed, called, and left messages on facebook to see how we were doing! I really appreciate your love, concern, and friendship! 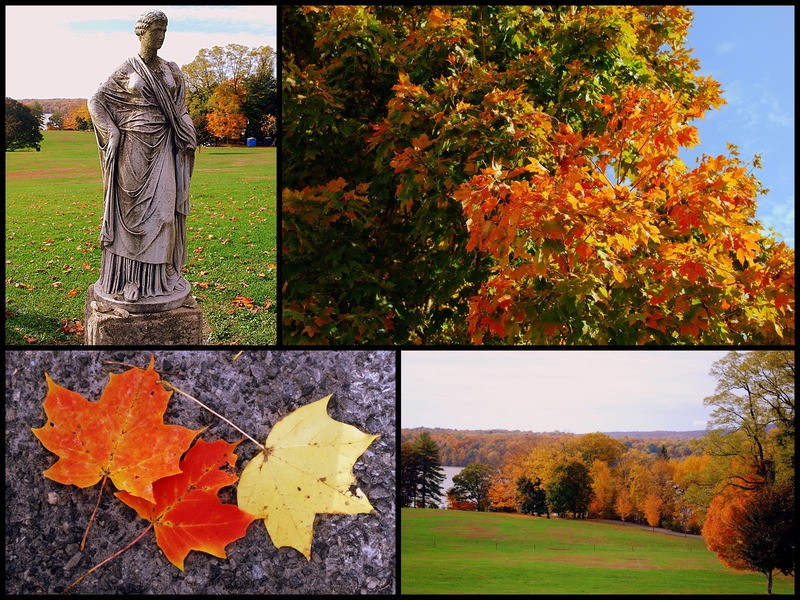 My husband and I drove upstate last weekend with two dear friends to enjoy the autumn foliage. New York State has a spectacular autumn color just as New England, and I believe the leaf color was at its peak. The scenery along our drive on the Taconic State Parkway was magnificent! I have to admit my camera was able to catch some good photos, even though I was sitting in the back seat of our friend's car. We had no set agenda for the day, other than to enjoy the beautiful weather and scenery, and we decided to stop at the historic town of Rhinebeck for lunch. 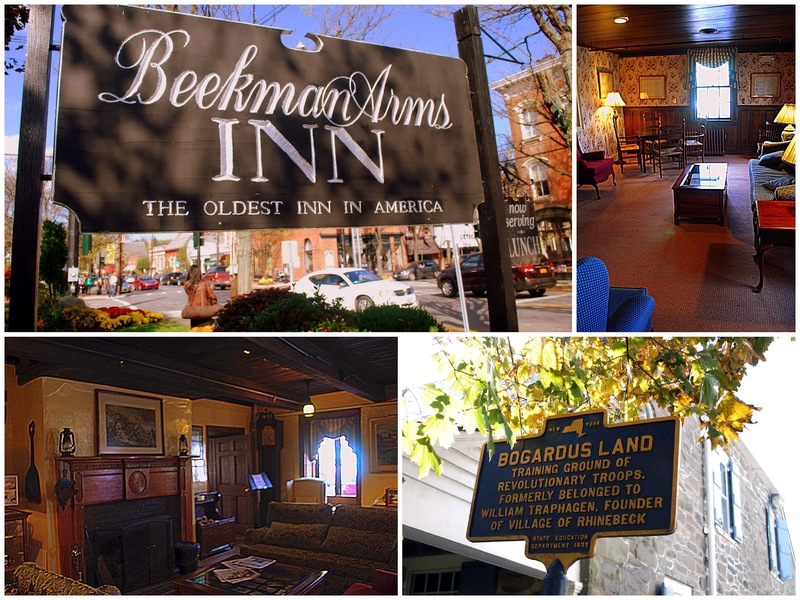 There we saw the beautiful Beekman Arms Inn that dates back to colonial times, and is the oldest inn still in continuous use in the United States! The original part of the inn was built in 1766 by Arent Traphagan. He was the son of William Traphagen who founded the town of Rhinebeck in 1688. The inn was originally known as Bogardus Tavern during the last third of the 18th century and helped host the military leaders of the American Revolution. George Washington, Philip Schuyler, Benedict Arnold and Alexander Hamilton all slept here! In 1775 the 4th Regiment of the Continental Army drilled on its front lawn before the war. During the Revolution, Rhinebeck, a part of the “Breadbasket of Dutchess County,” provided badly needed flour and grain to the American troops who were stationed in the Highlands to the south. In all, Dutchess County provided about one-third of all the grain consumed by the Americans. More about the fascinating history of this inn can be read on this link. We also visited the A.L. 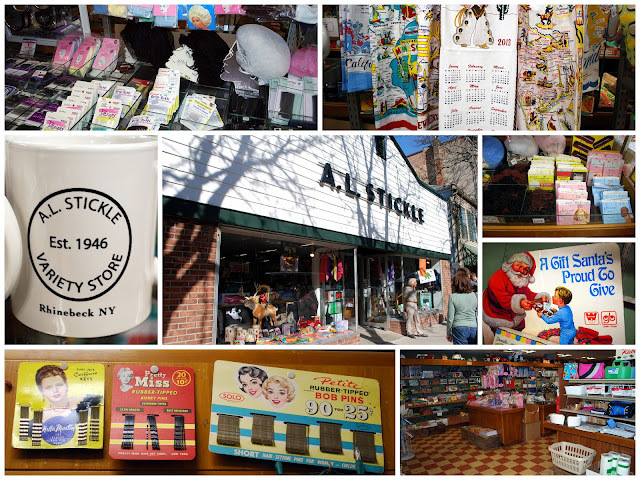 Stickle Variety Store, which was established in 1946 as an original 5 and 10 cents store. Walking along the aisles of the store was a trip down memory lane as they had for sale many old-time notions, gadgets, thingamajigs, and doodads that are hard to find any longer. It was so much fun to see things I remembered from my childhood. Check out their website to see a few of the products they offer by mail order. Driving out of the town of Rhinebeck we caught glimpses of the Hudson River rimmed with autumnal colors. This view of the river took my breath away! We pulled into Staatsburgh, a New York State Historic Site located within the boundaries of Mills-Norrie State Park. There we saw the Morgan Lewis mansion that was built in 1832 during the "gilded age." "It provides an example of the great estates built by America's financial and industrial leaders during the Gilded Age. A 25-room Greek Revival structure was built on the site in 1832 by Morgan Lewis and his wife, Gertrude Livingston, replacing an earlier house that had burned down. This second house was inherited by Ruth Livingston Mills, wife of noted financier and philanthropist Ogden Mills. In 1895, Mr. and Mrs. Mills commissioned the prestigious New York City architectural firm of McKim, Mead, and White to remodel and enlarge their Staatsburg home. After completion in 1896, the house was transformed into a Beaux-Arts mansion of 65 rooms and 14 bathrooms. Its exterior was embellished with balustrades, pilasters, floral swags, and a massive portico. The rooms were furnished with elaborately carved and gilded furniture; fine oriental rugs; silk fabrics; and a collection of art objects from Europe, ancient Greece, and the Far East." This elegant mansion, restored to its turn-of-the-century appearance, is open for tours and the house and grounds offer special events throughout the year. We did not go on the house tour but enjoyed strolling around the beautiful grounds. Can you see the leaves falling from this tree? It was so peaceful to take a few minutes to enjoy this sight! We drove down to Poughkeepsie, NY to take the walkway over the Hudson River--a spectacular view you won't want to miss that I'll show on my next blog post--I hope you will come back to join me again then! On my visit to Portsmouth, New Hampshire last year, which you can read about on this link, my husband and I were taken on a side trip by his co-workers over to Cape Neddick Point, which is at the north end of Long Sands Beach in the village of York Beach, Maine. There we were able to view this beautiful lighthouse on Nubble Island, called both the Cape Neddick and the Nubble Lighthouse. I was so excited to have the chance to see this lighthouse, as a photo of it in winter, lighted for Christmas, was my computer's screen saver for many years. To actually see the lighthouse in person was a memorable treat! The Nubble Lighthouse station was established in 1879, and the present brick and cast iron lighthouse was built in 1879. It was automated in 1987, retaining its fourth-order Fresnel lens that was installed in 1928. The height of the lighthouse tower is 41 feet, but because of the additional height of the steep rocky islet on which it sits, it stands 88 feet above sea level. Nearby are the 1879 keeper's house, built in 1879, the 1902 oil house storage building, and the boathouse, rebuilt in 1978 after a storm destroyed the original one. When the light was automated in 1987 the last Coast Guard keeper was removed. In 1998, ownership of the Nubble Lighthouse was given to the Town of York through the Maine Lights Program. In all, the Maine Lights Program was awarded ownership to twenty-eight other Maine lighthouse, all former US Coast Guard properties. More about the history of this well-loved lighthouse can be read on this link. The lighthouse is not open to the public, but it can be easily viewed from Sohier Park. I stood at the edge of this park and took a video of the Atlantic Ocean's waves crashing on the shore, the lighthouse on Nubble Island and then the rest of Cape Neddick Point. If you watch my Youtube video you can see the bucket pulley system that was set up to ferry supplies back and forth to the island at one time. You can watch the video on YouTube at this link. As you can see it is a beautiful place to visit! Did you see the bucket pulley lines? 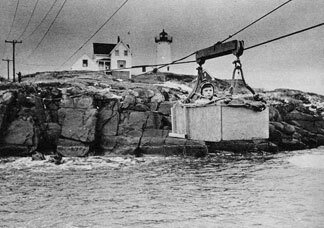 This bucket system, installed in the 1950s, was never intended for the transport of people, but around 1967, Coast Guard keeper at the time, David Winchester, put his two children in the bucket each morning to send them on their way to school. The photo above caused quite a stir when it appeared in newspapers. The district commander saw the photo in a Boston paper and made arrangements to board the children on the mainland during the week. Soon after that, it became policy that families with school-age children were not sent to the Nubble. An informational placard about the lighthouse in Sohier Park. I have to admit I was envious of the people who live in this gorgeous house at the beginning of Cape Neddick, as they have a clear view of the lighthouse from their eastern windows. I would love to sit in those Adirondack chairs that I spied in their backyard and stare out at the ocean. I don't think I'd ever tire of that beautiful view! We also spied a seasonal lobster house nearby that was getting a jump on the Christmas season with this lobster crate Christmas tree in front. They have a webcam on the website of their view of the lighthouse, that you can view on this link. Although our visit to Maine was very short, we could not leave without having New England clam chowder and a lobster dinner. Both were delicious -- just look at the size of those lobster claws! As the day ended we drove back to New Hampshire where we were going to leave for New York the next morning. Our last view of Maine was this beautiful sunset. All of New England is special and we really hope to be able to re-visit these areas again one day. On the home front, we are still trying to sell our home in Brooklyn. The market has unfortunately been very slow. We live in a very nice middle-class family neighborhood, but it just may be that not many families are looking to buy a house right now, or can't afford one. If we see that this trend lasts until November we are going to begin packing at that time, even if we don't sell, and leave our house on the market. We're sure it will take us quite a while to pack, and sell the furniture we are not moving with us, so our timeline is that we probably won't be able to move until the winter. Driving across the country in winter will be an experience I'm sure! Our granddaughter is due in February so we would like to be in Colorado by the time of her birth and settled. Please keep us in your prayers that all these plans fall into place and that sooner than later our house will sell. It's going to be a big move -- Thanks! Plus, don't forget to enter the BlogHer and Blue 365 $500 gift card Sweepstakes on my prior post. 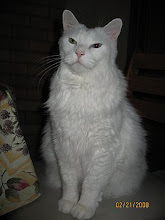 I had a lucky winner in the last sweepstakes that was linked to my blog! Blue 365 Program for a Healthy Lifestyle and a $500 Gift Card Sweepstakes! I love autumn! It is my favorite season of the year. The trees in New York City begin to put on their autumn dress in October, and the city parks become breathtakingly beautiful! I love autumn's bounty of bright orange pumpkins, wonderful harvest fresh fruits and vegetables, and I even enjoy the chore of raking the leaves! The crisp cool weather rejuvenates me both mentally and physically, and encourages me to let go the lazy days of summer and get back to pursuing healthy habits. That is why I was intrigued to recently learn about the Blue365®, a national program offered by the Blue Cross and Blue Shield Association to members of participating Blue Cross and/or Blue Shield Companies. Blue365 makes it easier to incorporate fun, healthy activities into your budget by offering access to savings on a wide variety of fitness, nutrition, and even travel options! After registering online, you will be able to qualify for "Featured Deals," and long term "Ongoing Deals," that are offered in weekly e-mails sent to your inbox, which will help you maintain healthy lifestyle choices. The Blue Cross and Blue Shield Association has a Facebook page you can join to see the deals as they are offered. The website is easy to navigate, and I was interested in many of the deals that I saw on it, such as a 20% discount on Reebok online store purchases under the Fitness category, and 50% off three bottles of Argentous alcohol free hand sanitizer in the Personal Care category. Unfortunately, even though I presently have a health insurance plan through a Blue Company, mine doesn't yet participate in the Blue365 Program. I signed up anyway, as they will notify me if my Blue Company does join at a future date. To see the deals that bloggers chose to take advantage of, whose Blue Company already participates, see this link. Check to see if your Blue Company participates in Blue365 on this link, and then register to take advantage of all the deals. If your plan does not participate, why not register anyway, like I did, in case they join at a later date? The Blue Cross and Blue Shield Association is committed to helping Blue Companies' members live healthy, happy lives. They help make being healthy more affordable, which is definitely something we can all appreciate! How are you planning to stay healthy through the Fall and holiday season? Answer this question in my blog's comments section and you will be entered in the sweepstakes to possibly win one of two $500 Visa gift cards, courtesy of BlogHer. Good luck! This Blue365® Program Sweepstakes runs from 10/16/12-11/12/12. 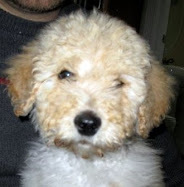 Be sure to visit the Blue365® page on BlogHer.com where you can read other bloggers’ posts! 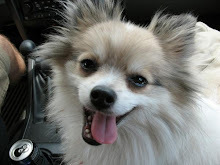 As full disclosure I am being compensated by BlogHer and Blue365® for this post, but all opinions expressed are my own. 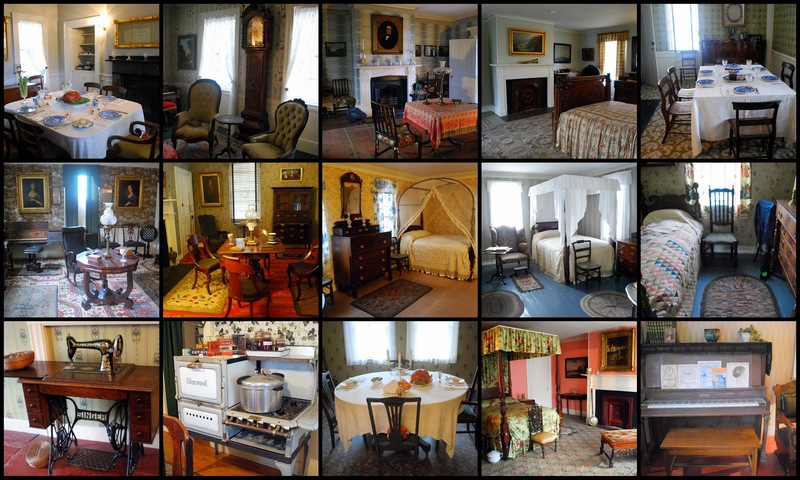 Portsmouth, NH and the "Strawbery Banke Museum"
I can't believe I went to the charming town of Portsmouth, New Hampshire almost a year ago today, and never had the chance to blog about it! My husband had to attend a business meeting there for a couple days last year, and I went along, as I love this town! 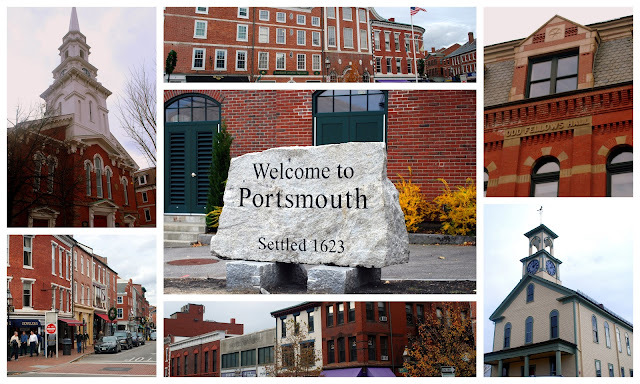 Portsmouth, N.H., a city of roughly 21,000 people, sits near the mouth of the Piscataqua River, a short, wide river that divides New Hampshire and Maine. 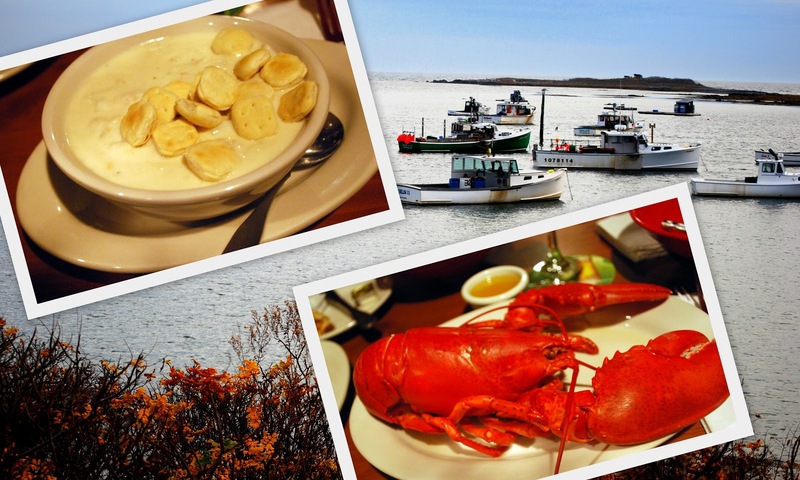 As a historic New England seaport city, it is a popular tourist destination full of wonderful restaurants, shopping, and scenic venues. Settled in 1623, Portsmouth claims to be the nation's third-oldest city. The original New Hampshire State House is located on Market Square in Portsmouth. It can be seen above as the building with large windows and chimneys on top. As you can see by its identifying plaque it was the seat of colonial government from 1758-1776. The American Declaration of Independence was read from the building on July 18, 1776. Also, President George Washington spoke from the balcony on October 31, 1789. Do pirates now ride motorcycles? It seems Portsmouth is also a town full of fun surprises! The beautiful and historic "Strawbery Banke Museum" (*note-the unusual spelling is not a typographical error) village is located in Portsmouth, and we had the opportunity to visit the area and take a tour. "Originally named Strawbery Banke by early (1630) British settlers for the wild berries growing there, Strawbery Banke today is unique among outdoor history museums - tracing 375 years of history in one of America's oldest continuously occupied neighborhoods. The 10-acre site, with its authentically restored houses and shops, period gardens, and costumed role players, presents the daily lives of ordinary people who lived here - from Colonial times to World War II, from the mundane to the elegant, from economic boom to wartime austerity - in engaging and accessible ways. 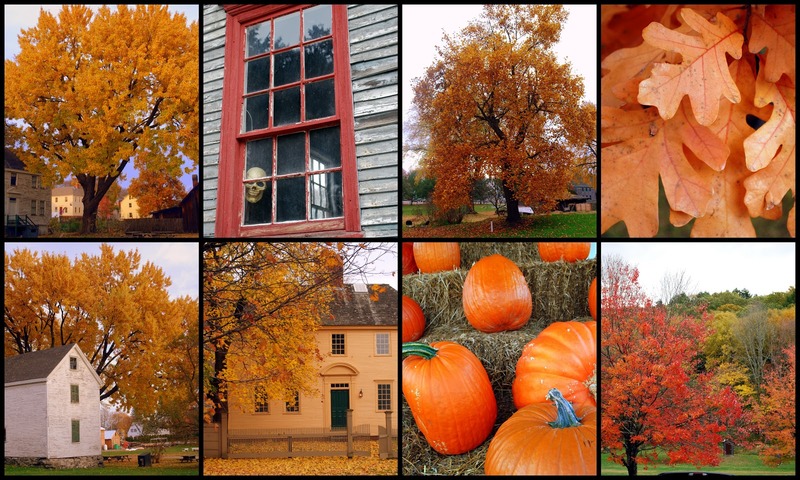 Strawbery Banke Museum is a capsule of New England seaport life across four centuries." 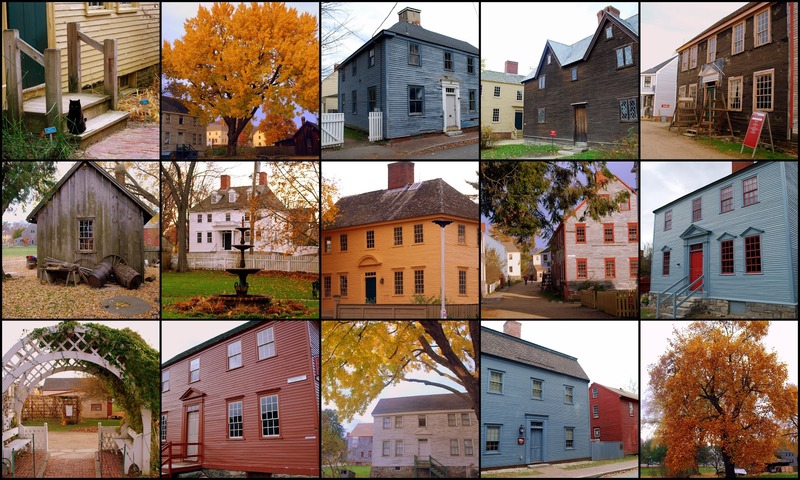 "Strawbery Banke is unique among outdoor history museums in presenting an authentic neighborhood, with most of the 42 historic buildings on their original foundations. These structures, the earliest dating to 1695, provide our strongest link to the lives of the people who lived in this neighborhood. Some of the houses have been restored and furnished to particular periods in the past; some are used for exhibits on such special themes as architecture or archaeology; still, others serve as shops for artisans practicing traditional trades." By the way - all the photos in this post can be enlarged by clicking on them once, and then again when they open on a new page. You can view much more detail in these photo collages by enlarging them that way. 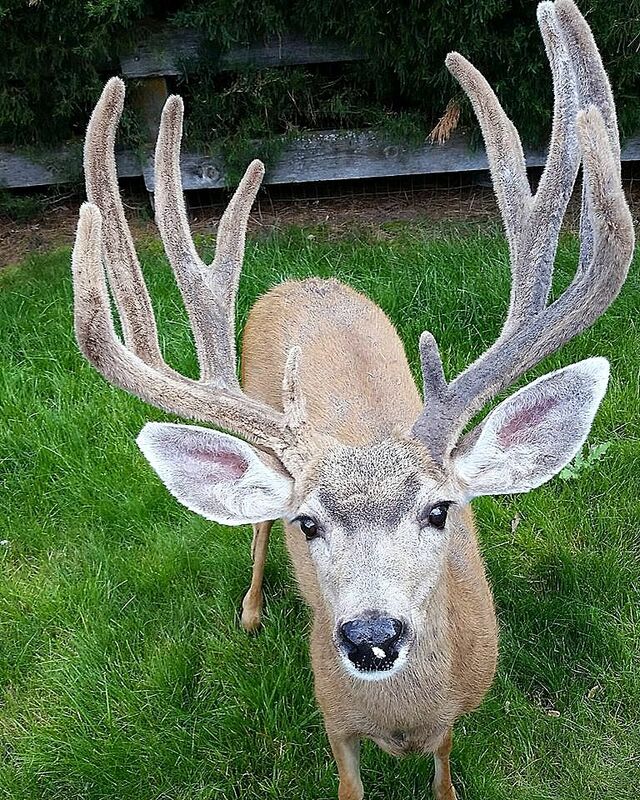 Use the back arrow to return to my post after viewing the enlargements. Although the historical re-enactors were not there the day we visited, as it was off season, house tours were still available, and we saw homes decorated as they would have been over the four centuries this area was a thriving community. One of my favorite rooms was this 1940's era kitchen! It reminded me so much of my maternal grandmother's kitchen, as I remember it when I was a child. She had almost the same black, wood and coal burning cast iron stove. The radio on the desk on the right was playing old-time radio show tape--it was so warm and cozy and wonderfully nostalgic! 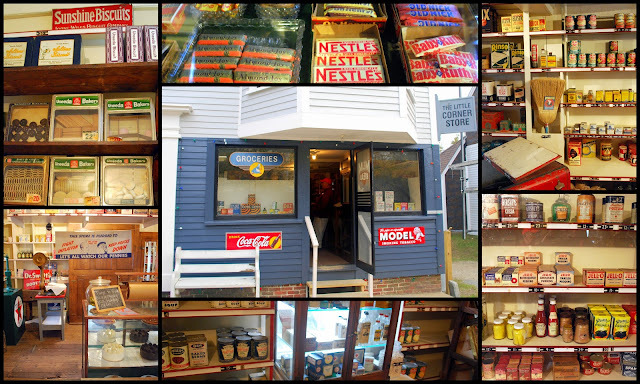 Another favorite building was the "Little Corner Store" that was next door to the country kitchen I showed above. Again, it reminded me of visiting my grandmother, who lived in a small town in Pennsylvania during my childhood. There was a small store, very much like this one, on her corner. My grandmother always gave each of her grandchildren a quarter when we visited, which felt like a fortune. As young children, my siblings and I used to be able to buy a large Nestle candy bar for only five cents! Are you old enough to remember penny candy? I never thought I'd be old enough to say this, but: "Those were the days!" Of course, visiting a location in New England in autumn is a very special treat because of all the magnificent fall color that is everywhere, and Portsmouth, NH was no exception! I "oohed and aahed" everywhere we went that day. Did you notice the "face" in one of the Strawbery Banke Museum house windows above? Halloween had just passed, and a museum staff member must have had a sense of humor to leave that image peeking out the window! There are some wonderful historic lighthouses in this area of New England, and, as I am a lighthouse aficionado, I was fortunate to have a co-worker of my husband take us around to view them! Above is a distant view of the Whaleback Lighthouse located in the mouth of the Piscataqua River, nearest to Kittery, Maine. This lighthouse was established in 1830; the present granite lighthouse was built in 1872, and it was automated in 1963. This lighthouse can be seen from many spots on shore, including Fort Foster in Kittery, Fort Constitution, Fort Stark, and Great Island Common in New Castle, NH, and Odiorne Point in Rye, NH. The lighthouse is accessible only by boat and is closed to the public. Even in early November, a few wild pink roses were still blooming in the area along the coastline! The North East experienced a very mild winter last year. I'd love to show you more about the other lighthouses we saw in a future post... please stayed tuned! 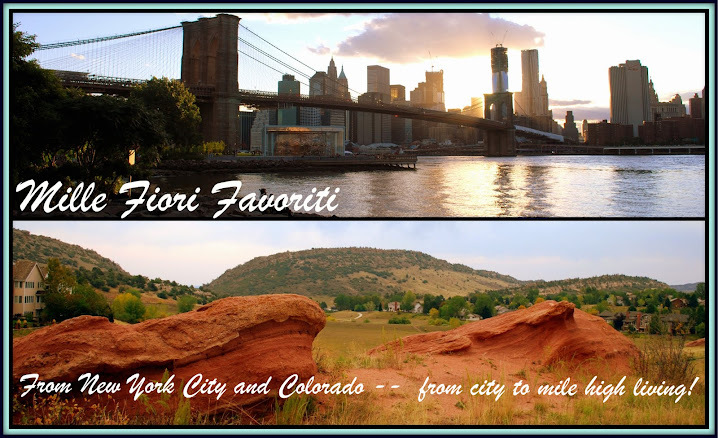 Four New Bertolli Entrees Give Away!